I feel like we should have a category called, “Yup, you read that right.” A category where all the weird stuff that comes out of Hollywood would be cataloged and placed aside from real news pieces. This story would fit perfectly into that, because actor Jean-Claude Van Damme has responded to Chris Hemsworth wish of wanting to work alongside the famed martial arts star. First, I’m impressed that Van Damme apparently actually knows comic books. Which is more than I can say for some actors out there who inhabit the roles they play. However, I’m not sure I can see him as a good fit for any role in the Marvel universe currently. There is a Fantastic Four reboot on the way, so maybe he’s trying to drop a hint that he wants in? Nah, most likely he was responding to another actor, and acknowledging that he heard him. 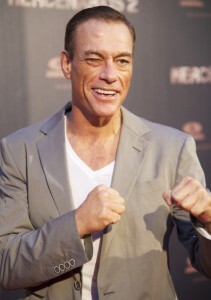 Both Avengers 2 and Fantastic Four are both being release in 2015, so Van Damme better hurry and get cast if he wishes to star alongside Hemsworth. Also, because I’m in a good mood. Here is a video of Van Damme in 1984’s Breakin‘. You can catch him in the background, dancing like a spaz.